Your furry friend’s cousins, coyotes and wolves, both eat foliage in the wild to survive. So, despite contrary opinions as to the benefit of serving domesticated dogs fruits and vegetables, dogs can eat olives! They can also eat some olive products and an even more diverse list of fruits and vegetables. In fact, several experts even suggest substituting olives for typical dog treats occasionally and in moderation. By letting your dog snack on olives you will satisfy their urge to dine with you and actually provide some nutrients they may not be getting in their diet otherwise. What Olives are Safe for dogs? There are many different brands and kinds of olives on the market today. Fortunately, almost all olives are safe for your pet. This includes green olives which are not fully ripe and black olives which are fully ripe. However, there are some guidelines to follow if you want to feed this healthy fruit to your dog. Try to avoid canned olives and serve your pup fresh olives instead. Often canned products will have added sodium to pickle the olive. This added sodium is too much for your dog. Additionally, you should only treat you pup to pitted olives. The pits that occur naturally in the fruit can damage a dog’s teeth and pose a choking hazard especially in smaller breeds. If your beloved buddy does swallow an olive pit don’t worry too much. As long as they are able to breathe properly, the pit should pass their system without major consequence. Remember, it’s always best to give your dog a small piece before offering a whole olive. This principle is true whenever you introduce something new into your dog’s diet. Every dog is different and has their own immune system. Your dog may be allergic to olives. Some pups have sensitive stomachs, which may become upset when eating olives. Other dogs simply will not like the taste of olives at all. By giving your dog just a small sample, you can be sure they tolerate and like it! If your dog does like olives, then they’re in luck. 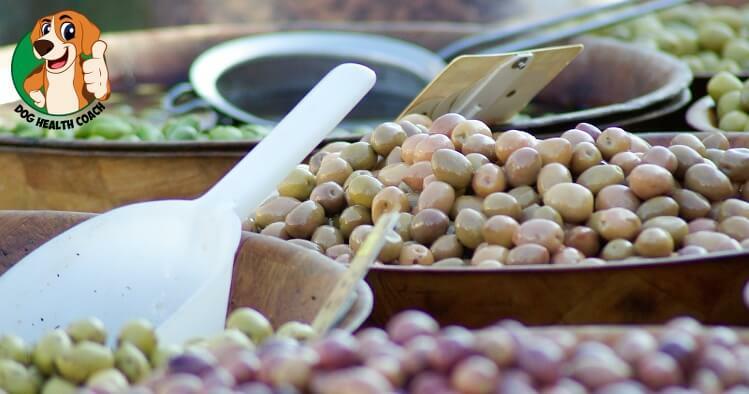 They can reap amazing health benefits by consuming olives and olive products. Olives are high in monounsaturated fats which, in general, can help lowers bad cholesterol. Lower LDL cholesterol in your dog’s blood significantly lowers the risk of heart disease and stroke. Use caution as your pup has a more difficult time digesting the fats. In fact, having an excess of monounsaturated fats in your dog’s diet can cause pancreatitis, a condition characterized by an inflamed pancreas. Limit your pup’s the intake to 2-3 whole olives for this reason. As disclosed above, both ripe (black) and underripe (green) olives are safe for your pooch. Both are also high in protein, vitamin A, vitamin E and vitamin K. You may realize how crucial protein is to your pooch’s well-being but vitamins A, E and K are just as essential. Vitamins A & E can help your furry friend keep their eyesight and maintain their coat, while vitamin K maintains bone health. Olives also contain calcium, which can improve your dog’s bone density. Whole olives as treats aren’t the only way dog can consume olives. Extra virgin olive oil is a great addition to your pup regular kibble. Most experts recommend a teaspoon a day for a 30 to 40 lb. dog, or up to a tablespoon for a large 90 lb. dog. This supplement can improve the taste of your dog’s chow, aid in weight loss and help maintain a dandruff free coat during the winter. Unfortunately, dogs cannot really eat olive bread. Normal bread is ok for puppies (although not very nutritious), but most olive bread is also flavored with onions and garlic. These two vegetables are toxic to your furry friend. If your dog does eat olive bread and begins showing sign of illness, such as lethargy or difficult breathing, please contact your vet immediately. Aside from olives there are lots of common fruits and vegetables that are safe for your dog. Green beans, carrots and pumpkin are great whole foods your dog can enjoy. In hot weather, your pup can even indulge in frozen strawberries, blueberries or bananas. Did you know that our favorite puppy pets can even eat yogurt in moderation? Sharing food with you dog is a great way to bond with your pet, as long as you are sure the foods you are serving are safe and healthy. What do you think about feeding your pet olives and other fruits or vegetables? What is your experience? Do you have any surprising or interesting stories to share? Please comment below!